Prototype organic retinal implants are being grown on a photosensitive polymer hybrid by researchers at the Italian Institute of Technology. Retinal implants restore some degree of vision by sending a signal from an external video camera to metal electrodes implanted at the back of the retina. (See this article on the MIT Retinal Implant and the 'Bionic Eye' Argus II Retinal Implant for more information). 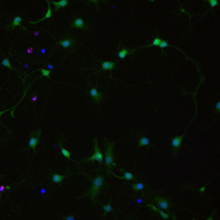 The Guglielmo Lanzani lab grew neural cells in a petri dish directly on top of the polymer. Light shined on the polymer activates the photodiodes, which stimulate individual neurons much the way light-sensitive photoreceptor cells in a healthy eye cause neurons to fire. (In contrast, the Argus II stimulates up to hundreds of thousands of neurons at one go.) Developed further, the Lanzani approach could lead to a retinal implant that produces much clearer vision. The researchers grew rat embryonic hippocampal neurons on a substrate consisting of photodiodes made of indium tin oxide coated with a layer of photoconducting organic polymer, and another organic layer that functioned as an adhesive. The rat neurons and the diodes were immersed in an ionic solution. The diodes, when activated by light, triggered a charge imbalance in the ionic solution, which caused the neurons to fire. Next, Lanzani plans to use printing techniques to position the photodiodes on the device precisely, more closely mimicking the geometry of the photoreceptor cells in the human retina. He says the photodiodes could be color-sensitized, to produce images in color rather than just black and white. If you can grow a biocompatible retinal implant, sooner or later you'll want to make your own complete eyes. Science fiction fans have been on the lookout for artificial eyes ever since we saw them in Ridley Scott's 1982 film Blade Runner. 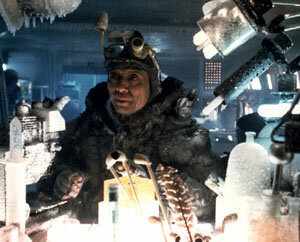 A genetic designer of eyes has an unpleasant meeting with replicants who interrupt his lab work. Case turned his head and looked up into Wage's face. It was a tanned and forgettable mask. The eyes were vatgrown sea-green Nikon transplants.